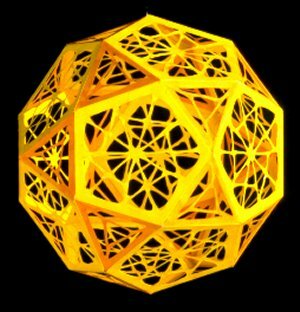 The id (icosidodecahedron) is made of 20 triangles and 12 pentagons. The edges of the id can be connected by triangles (first number), pentagons (second number) and by decagons (third number). Thus 7 polyhedra appear, four of which have 5 pyramidal resp. 3 pyramidal symmetry. 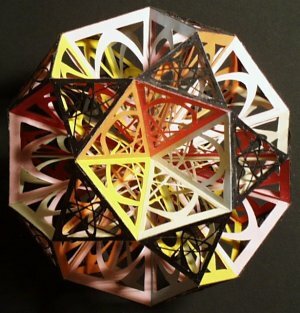 The remaining three figures are icosahedral. 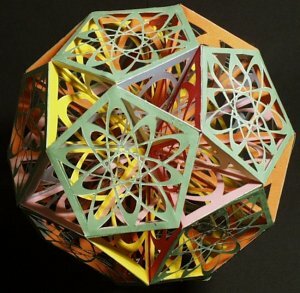 They are the small dodecahemidodecahedron (sidhid), the small icosihemidodecahedron (seihid) and the id itself.